Looking for the latest Foxy Casino promo code or Foxy Bingo promo code 2019? Step this way. New players can get free play when they sign up with the code and meet the minimum deposit (terms and conditions apply). What I can get with the 2019 Foxy Casino and Foxy Bingo promo codes? What can you play on Foxy Bingo? Choose your bonus from the table above and click the button to access the site. Create a new account and register with your personal details. You must meet the wagering requirements before you can make a withdrawal. You must be 18 or over to play on the site and activate the Foxy Bingo promo code. One welcome bonus is offered per new sign up. The creation of several accounts by one user is prohibited. All Foxy Bingo bonuses are credited in bingo funds. You must deposit a minimum of £10 in order to activate the Foxy promo code bonus. There is a 4x turnover requirement in order to get the bonus funds. Your maximum bonus using the Foxy promo code will be £120. There must be at least £30 in your Foxy account before you can withdraw funds. The operator can change or amend the offer at any time. The Foxy Bingo promo code offer is valid for all of 2019. If bingo's your thing you've come to the right place. There are a host of bingo games, including the most popular version 90-ball bingo. You can buy tickets to enter the bingo rooms with your Foxy Bingo promo code bonus credit. Entrance starts from as low as 5 pence per ticket. There are several 90-ball bingo rooms to choose from including; 90 Ball Jackpots, Argy Bargy, Bingo Sisters and Big Bingo Nights. The rules stay the same as offline bingo, when you get a full house of called numbers you're a winner. If you fancy something a bit different then try out 75-ball bingo. This is a slightly quicker variation of the classic 90-ball game – where you have to fill in pre-selected patterns instead of lines in order to get a winner. There's also Foxy Fives, a spin on 52-5 bingo. In this game you'll get a hand of 5 cards to play with rather than bingo balls. The only way you can win this game is by having a Full House, when all the five cards from your selected hand are called. On top of that there are some VIP rooms where you can take part in special jackpot games. There are games all day long, so you will never have to wait long to join a room. Don't forget you can use your Foxy Bingo promo code to play on any of these games. Once you've browsed the Bingo offerings, the operator's Casino platform is another great place to try your luck at winning. If you prefer to play your bingo at night, this is the promotion for you. Between 7pm – 11pm every night you can take part in the Big Bingo Nights room for the chance to win jackpots for just 5p a go. From 7pm there's a guaranteed jackpot of £1,000, but a special twist – the more you play, the more the jackpot increases. All you need to do is opt into one of the 90-ball bingo games starting every six minutes from 7pm. Foxy Bingo is a very friendly platform and they aim to reward loyal members. This site has two loyalty schemes in place, the Membership Scheme and Loyalty Points. Both of these reward Bingo players who come to the site with prizes such as a “Birthday Bonus” and free games. Your loyalty points will accumulate automatically as you play on the site. For every 10p that you spend on a card Foxy Bingo will reward you with a point. 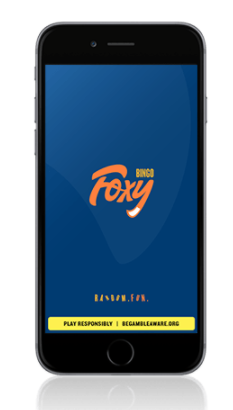 Members can enjoy all the benefits of Foxy Bingo on the app which is available on iPhone, Android and Tablets. All slots and jackpot games are optimised for mobile devices. Foxy Bingo can be downloaded for free on the App Store or for Android. Once you've decided you want to use the Foxy Bingo promo code, you're going to need to deposit some cash with the bookie. Here's the lowdown on how you can deposit and withdraw with Foxy online. It's fairly simple, and the operator accepts the majority of payment types that you'll be familar with. Here's the different time delays and amounts that come into play when you withdraw your winnings. If you run into trouble using the promo code or depositing money, Foxy are there to help you. The customer services number (0800 279 4501) can be called for free between 6am to 11pm every day of the week. If you’d rather contact by email you can on info@support.foxybingo.com. The response time on this is 48 hours so you might want to turn to Live Chat for help on a more urgent problem. but given the response time is 48 hours this is only best for a problem that isn’t really urgent. The only downside is that the Live Chat is only open from 6am – 11pm, as opposed to the usual 24/7 service provided by most bookies.